Traumatic brain injuries happen across the United States every day, caused by many different things and resulting in confusion, pain and fear for the victim. Auto accidents, bicycle accidents and other personal injury cases often involve one or more victims with some for of traumatic brain injury. A traumatic brain injury (TBI) can be classified as “mild” if loss of consciousness and/or confusion and disorientation lasts less than 30 minutes. And while some people may hear the TBI called “mild,” and dismiss the injury, the impact on the victim and their family can be extremely difficult. Mild traumatic brain injuries also go by the following names: concussion, minor head trauma, minor TBI, minor brain injury, and minor head injury. If you hear any of those words from a doctor or medical professional, you have suffered damage to the brain and should follow their directions carefully. $155,000. Settlement for our client who suffered a concussion and a broken leg in a rear-end accident involving a semi truck while driving on the highway. The insurance company for the trucker attempted to lowball our client, and only after hiring Davis Law Group did the insurance adjuster take the claim seriously. $100,000. Jury verdict for our client, a man who hit his head on a car’s windshield while biking. The insurance company disputed liability, saying their driver was not totally at fault. $75,000. Settlement for a man who suffered a mild TBI in a T-bone collision at a red light. $75,000. Settlement in a case involving a child passenger who suffered a concussion in a car accident. $45,000. Out-of-court settlement for a woman who suffered a head injury while riding her bike. $10,000. Settlement for a victim of a parking lot collision. Our client suffered headaches for weeks after the accident. There is no settlement calculator for mild TBI claims, and determining the value of your case is usually best left to an experienced personal injury lawyer with a background handling brain injury cases. Settlement values for mild traumatic brain injuries vary widely, and the specifics of each individual case go a long way toward determining the ultimate result. Generally the more severe the brain injury, the more settlement money the victim will receive. It may be years for the symptoms to show, and it’s important that every potential head injury be treated seriously. Medical bills. This area covers a wide range of items that result from your brain injury. This can include hospital visits, imaging, doctor’s visits, rehab, mental health examinations, etc. Lost wages. If your mild TBI caused you to miss time from work, you can be compensated for those hours or days that you missed. Pain and suffering. The more severe the head injury, the more an insurance company is likely to pay you for the pain and suffering you experienced. Future damages. If your brain injury has resulted in permanent differences in your life, your attorney will calculate that and include it in the settlement demand. Loss of enjoyment in life. If your head injury has resulted in depression or loss of enjoyment in life after the accident, you can recover that through the claims process. A personal injury attorney can identify all of the possible damages associated with your case. Insurance adjusters are much more likely to take your brain injury case serious if you have retained legal counsel. Medical records. Because head injuries typically do not show up on X-rays or other imaging, a victim’s case for damages usually rests on the severity of the after effects and other injuries suffered in the collision. Property damage. If an accident resulted in severe property damage, insurance adjusters and a jury will likely be more convinced that the concussion is legitimate. Accidents that appear minor with minimal damage to the vehicle are met with more suspicion. Doctor’s testimony. If a medical professional can attest to the severity of the concussion or TBI and prove how it has affected a victim’s life, that can go a long way toward maximizing the settlement value. Victim’s credibility. 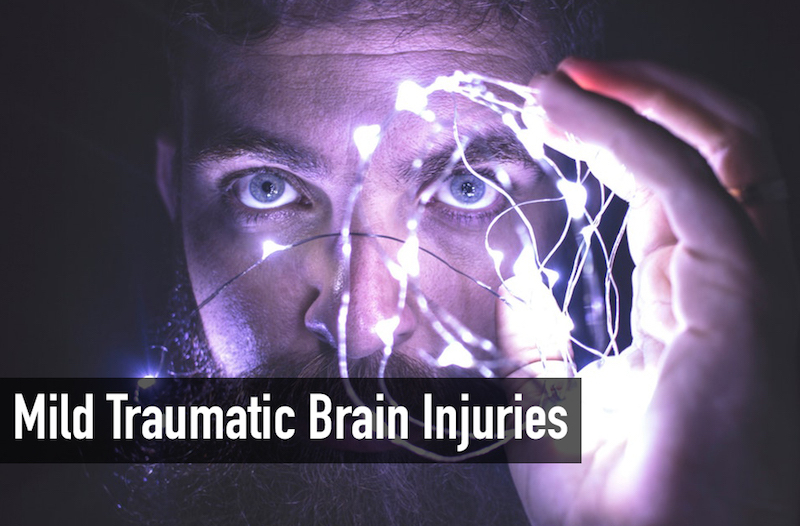 Because mild traumatic brain injuries are mostly subjective — there is no conclusive imaging or test that can be conducted — the victim’s believability often plays a part in determining the value of these cases. This particularly is the case if the case goes to trial, and a jury must decide if the plaintiff (victim) is telling the truth about the severity of the concussion. Victim’s can still recover damages for a concussion without the above criteria, but checking those boxes certainly helps. For assistance handling your auto accident case involving a concussion or TBI, contact a personal injury attorney. Anywhere from 30% to 80% of people that suffer a mild traumatic brain injury also suffer from what is known as post-concussion syndrome (PCS). Post concussion syndrome is when the headaches or dizziness lasts longer than the normal recovery period (2-4 weeks) after a concussion. Victims with post concussion syndrome typically suffer from headaches, difficulty sleeping, sensitivity to light and sound, and difficulty concentrating. In many cases, these symptoms can derail a person’s normal life and seriously affect one’s ability to live in peace. For that reason, post concussion syndrome should definitely be included in any potential legal action for damages after an accident. It’s difficult to assign a value to post concussion syndrome, as it coincides with the brain injury itself. Some post concussion syndrome cases can be long, difficult to treat and require a lot work to overcome. Other cases are relatively minor and can go away in several weeks. Davis Law Group believes that every successful brain injury case starts with the injured victim having up-to-date and accurate information about the legal process. 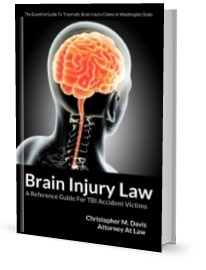 That's why our very own attorney Chris Davis has authored a free legal guide for brain injury victims titled, Brain Injury Law: A Reference Guide For TBI Accident Victims. We provide free copies of this book and others to victims and their loved ones. Most people that suffer a mild traumatic brain injury do not experience any long-term problems. While this is without question a positive, it doesn’t make the short-term outlook for victims any easier. Mild TBIs occur all the time. Victims may hit their head in a car crash, fall down on hard pavement, or collide with a a teammate or opponent while playing sports. Thankfully the brain is protected by a shock-absorbing liquid and can withstand serious blows to the head and recovery over time. Most medical experts say that the symptoms of a mild traumatic brain injury typically fade away within a month or so. Much of the research surrounding these injuries suggest that there is no short-term or long-term cognitive or behavioral risk. Doctors may have a tough time isolating the symptoms of a mild traumatic brain injury after an accident because victims often suffer injuries in addition to the concussion. For example, headaches may persist well after the brain recovers, not because of the brain injury, but because of an injury to the neck or spine. Symptoms may not present themselves at the time of the injury, and may be delayed for days or weeks. Due to the chaotic nature of car accidents and injuries in general, symptoms are often missed and/or misdiagnosed. While a person may seem normal and return to their everyday routine, small changes may occur in a their behavior. Mild traumatic brain injuries do not follow a pattern and every victim deals with the symptoms differently. It’s important to pay close attention and receive medical treatment if you have any concerns about a possible TBI after an accident. Headaches after a car accident usually occur in a two week time period after the accident. This ailment is caused by the whiplash action of the head and neck — the typical whiplash headache starts in the back of the neck and then radiates to the frontal region. While most of these headaches will resolve themselves in six months or less, about 10-20% do not go away. If that’s the case, your injury claim should reflect that permanent damage. Some victims of car accidents experience migraines as a result of the mild TBI. Insurance companies are quick to pin these migraines on genetic disorders, not the accident itself. The truth is that post-trauma headaches have the characteristics of migraines, and while it may not technically be a migraine, it feels like one for the victim. Insurance companies and the adjusters that work for them are quick to deny or devalue cases that include headaches or migraines as damages. Because an adjuster or jury cannot see the headache, it’s easy for them to cast doubt over the legitimacy of your claim. Moderate to severe traumatic brain injuries are backed by more evidence and have proven treatments available. Unfortunately the same cannot be said for mild head injuries. Medical professionals have said that the best treatment for mild TBI is an awareness of the symptoms and prevention of further damage to the brain. Experts have said that cognitive, physical, occupational, and if necessary, vocational therapy, neuropsychological testing, necessary medications, and continued monitoring by specialists is the best treatment for these injuries. Head injuries are the most serious injuries workers can suffer at work, and their long-term prognosis will determine how much they receive for their injuries. A head injury can cause serious physical, neurological and behavioral damage to a person, and when that injury happens at work, a victim must rely on workers’ compensation. It’s important that workers seek immediate medical attention after a head injury and that they tell the doctor that the injury happened on the job. Workers’ compensation benefits include coverage for medical treatment and approximately two-thirds of lost wages. Smaller, more mild traumatic brain injury cases are usually not difficult to handle through your employer’s insurance company. But when the injury is serious and the damages are high, consulting with an attorney may be in your best interest. Davis Law Group attorneys do not handle workers’ compensation claims. If your brain injury was caused by the negligence of someone else, you deserve to be compensated not just for the medical treatments, but also for the decreased quality of life that results from pain or from permanent impairment. And if a brain injury has caused the death of a family member or loved one, you should be entitled to compensation for the lost companionship as well as for the lost financial support your loved one was providing. Consult with an experienced brain injury attorney to learn about your legal options and the best steps to take. For a free case evaluation with the attorneys at Davis Law Group in Seattle, call (206) 727-4000. You can also use the chat feature below or fill out the form on the contact page.